Libros de texto españoles con explicaciones en Inglés. This perennial best-seller is written for Advanced Grammar and Composition or Advanced Composition and Conversation classes. 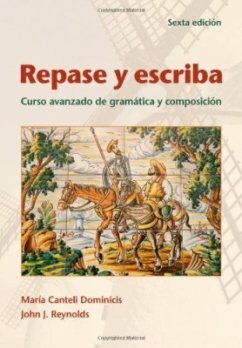 Repase y escriba combines solid grammar coverage with contemporary readings from a variety of sources, including literature, magazines, and newspapers. Readings are preceded by a short passage introducing the author and the context and is followed by vocabulary, comprehension questions and conversation prompts. The Sección léxica teaches students proverbs, idioms, and word families. There are also topics for creative compositions with guidelines. With updated literary and cultural readings, Repase y Escriba includes an "oral exchange," to make the text more useful when stressing conversation.